Henry, John F., Revenue, 1862, First Issue, 4¢ Proprietary, part perf, bottom margin strip of 6, each with "J.F. Henry & Co., Waterbury, Ct., Oct 1, 1862" circular date stamp cancel, horizontal creases with one affecting 2nd stamp and sealed internal tear in 5th stamp, otherwise Fine, Scott catalog value $4,500 for pairs. Scott No. R22b Estimate $1,000 - 1,500. THE LARGEST KNOWN MULTIPLE OF THE 4¢ PROPRIETARY PART PERF ISSUE. Henry, John F., 2¢ violet, old paper, good color for this very fugitive issue, small thins and sealed tear at right, Fine appearance, scarce with 34 examples recorded in the Aldrich census (of which 25 are reported to be faulty). The initial colors of Henry's 2¢ and 4¢ stamps were unsatisfactory and he quickly asked that they be reprinted…"in bright colors, as the last were shocking bad!". Henry, John F., 4¢ bister, old paper, good color for this very fugitive issue, nicely centered, flaws including sealed tears, natural wrinkling and pressed horizontal crease, Fine appearance, rare with 20 examples recorded in the Aldrich census (of which 11 are reported to be faulty). Henry, John F., 1¢ blue, trial color large die proof, on India, stamp size with wide margins, bright and fresh, Very Fine and choice, a rare trial color proof, color unlisted in the Scott catalog, ex-Joyce. Scott No. RS114TC1 Estimate $300 - 400. Henry, John F., 1¢ green, trial color large die proof, on India, stamp size with large to wide margins, Very Fine, ex-Joyce. Henry, John F., 1¢ + 2¢ black, compound large die proof, on India (64x81mm), bright and fresh, Very Fine and choice, very scarce. 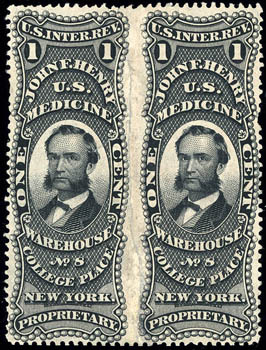 Henry, John F., 1¢ Black, Watermarked USIR, Horizontal Pair, Imperforate Between, separated and rejoined as always, deep color and sharp impression, left stamp with small tear and thin spots, Very Fine appearance, variety footnoted in the Scott catalog; with 1994 P.F. certificate. Scott No. RS114d var. Estimate $3,000 - 4,000. 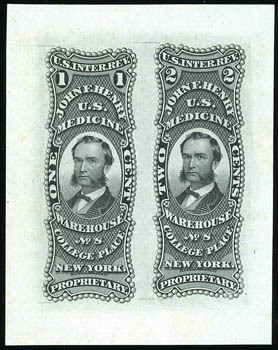 A RARE EXAMPLE OF THE JOHN F. HENRY 1¢ IMPERFORATE BETWEEN PAIR. ONLY THREE SUCH PAIRS ARE RECORDED.